View from the island of Santorini, which you can reach by various ferries. The Greek Islands have inspired myth and romance through the ages, from Homer’s Odyssey to "Zorba the Greek" to the movie "Mamma Mia." Riding the wine-dark sea, the wind in your hair, the sun beaming down from a limitless sky, and ancient islands dotting the horizon, you imagine yourself a Greek warrior returning triumphant from the Trojan War. Or a billionaire, sailing the high seas in a mammoth yacht. Fortunately, journeying in the land of heroism does not require an unlimited bank account. The tried and true way of traveling—taking the ferry—is an economical option with advantages over luxury routes. Ferries move slowly, allowing travelers to gaze at islands along the way and to talk with locals. As with most independent travel, there can be complications. With some thought and patience, a Greek Island odyssey won’t leave you stranded on Calypso’s island or caught in the whirlpools of Cherybdis. These days the worst trials may come from Lotus Eaters—backpackers sleeping on the beach in order to save more money for beer. Yet even Odysseus, while bearing Poseidon’s anger, enjoyed himself along the way. Here is how to do it. Trying to figure out the Greek ferry system can seem like medieval torture. Part of the problem lies in having so many choices. More than one-fifth of the Greek landmass consists of islands (6,000 total, of which 227 are inhabited). No point in Greece is more than 60 miles from the sea. Fortunately, the ferry system often solves the problem for you: the schedules dictate where you go. Understanding the ferry system is easier if you realize that it is set up by locals for locals. The upside: during holidays—Greek Easter, which falls after the Roman Catholic Easter (usually in April), and the national holiday on August 15 (Feast of the Assumption of the Virgin Mary)—routes are added for homeward bound locals heading to the family lamb roast. The downside: this being Greece, do not depend on it. Some routes are canceled altogether during holidays. Most locals are concerned with getting between Athens and the island they call home. When the ferry system was set up, someone decided on a hub and spoke system. The hub is Athens, with its main port of Piraeus (other ports include Rafina and Lavrio). The spokes are the islands. Ferries run from Athens to islands within a chain. Adding further to the complication, islands that appear geographically close can belong to different chains. 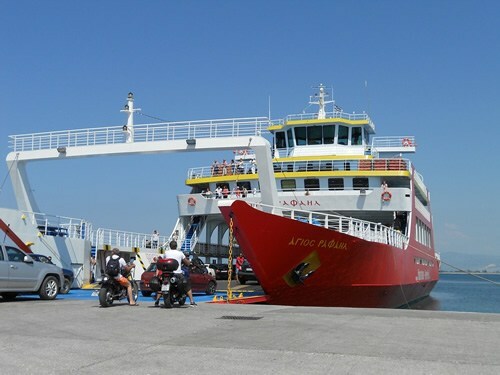 Greeks sometimes refer to inter-island travel as agonia routes because of the slow, dilapidated ferries that ply these waves. Unfortunately, these routes can be the only way to travel between chains without returning to Athens. Some ferries do not run daily, leaving travelers marooned for a day or two. Remaining patient and flexible can help—life could be worse than staying on a Greek island for an extra day. Editor's note: Recently, better online ferry reservaton systems have made booking ferries to one or multiple islands far more convenient and transparent. 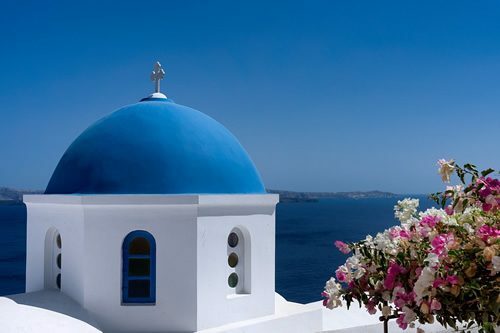 Hop onto a ferry at a variety of ports to go to the islands from Athens or from island to island. The best way to figure out Greek ferries is to stop trying so hard. Micro-managing the Greek ferry system is doomed to failure, resulting only in high blood pressure and angry travel partners. Three rules are helpful to keep in mind. Rule One: ferry tickets bought online create more hastle. No definitive source for Greek ferry routes and schedules exists, neither online nor in print. The Internet lists proposed schedules (most likely to change). Here’s why: Greek ferry companies submit their schedules to the government for approval two weeks before departure. So any schedules seen in December for a June trip are likely wrong. Rule Two: buying ferry tickets online and booking hotel rooms based on the promised schedule risks wasting money on a hotel room that cannot be used. Rule Three: taking a ferry back to the mainland the same day as your flight is a good way to miss your plane. Planning to stay a few days in Athens at the end of the trip can help avoid this nightmare scenario. Bottom line: it is advisable to wait until your arrival in Greece to buy ferry tickets. The two best ways to do so are through a travel agent in the port of departure, and at the port itself. Using a travel agent cuts down on footwork: just walk in, sit down in the nice air-conditioned office, and let them take care of it. The downside: Greek travel agents sell tickets for only a few ferry companies, so they won’t tell you about routes available from other companies. They also won’t tell you about the cheapest tickets. Instead of a slower, cheaper ferry, you could end up packed into a hydrofoil at twice the cost and no view of passing scenery. Since the commission for ferry tickets alone is not very high, travel agents may flat out refuse to book ferry tickets without also booking hotel reservations. Heading straight to the port is the no-nonsense way. Boat ticket offices post ferry schedules for the next several days at the port, which allows for shopping around to find the route you want at a desirable price. In the shoulder season (April to mid-June and September to November), tickets can usually be bought an hour before scheduled departure. In summer (July to August), popular routes sell out quickly so it is a good idea to buy tickets a few days before sailing. The Saronic Gulf Islands lie closest to Athens in the Saronic Gulf between Attica and the Peloponnese. Because of their proximity to Athens, they can be crowded with weekend day trippers. Though easily reached, the Saronic Gulf islands still offer a pleasant respite from the congestion of Athens. The northernmost Saronic Island is Aegina, with its beautiful Doric Temple of Aphaia set in a cool pine grove, and the house where Nikos Kazantzakis wrote Zorba the Greek. South of Aegina lies Poros, which has nice beaches but can be overrun with package tours in summer. Next comes gloriously car-free Hydra. In the 18th and 19th centuries, Hydra was a Greek shipping center and home to many wealthy sea captains whose neoclassical mansions litter the island. Farthest south lies Spetses, whose pine groves and decent beaches are popular with package tours. The Cyclades, (“Encircling Islands”), lie in the central Aegean. Delos, the mythical birthplace of Apollo and Artemis, lies at the center of this chain. Delos contains one of the most significant classical archeological sites in the world. 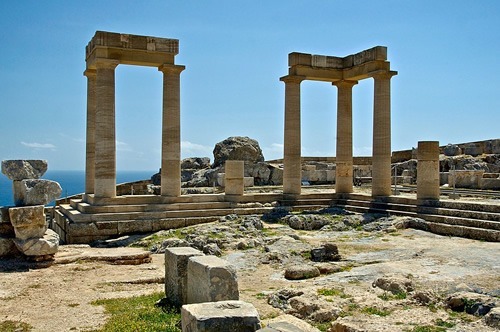 Once so sacred that birth and death were prohibited on this island, Delos was the ancient Greek spiritual and commercial hub of the Mediterranean. Today, visitors still cannot stay overnight on Delos or visit on Mondays. Mykonos—with its constant parties, sophisticated bars, and its sparkling white houses—also lies in the Cyclades. 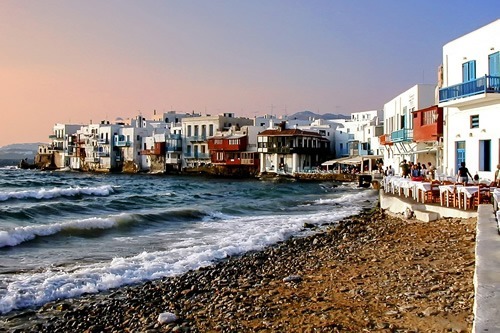 The “poor man’s Mykonos”, Paros, is the transportation hub of the Cyclades and also offers good beaches. Santorini boasts breathtaking sunsets from the cliff top village of Oía, black lava beaches, the remains of ancient Minoan Akrotiri, chic restaurants, boutique hotels, and one of the most jaw-dropping harbor entrances in the Mediterranean (especially as rosy-fingered dawn brightens the sky after an overnight ferry from Athens). Other Cycladic islands include Tinos (one of the least commercialized and popular with hikers), and car-free Folegandros with its beautiful terraced hillsides. The island of The Mykonos along the shore. One of many white and blue church domes in Santorini. 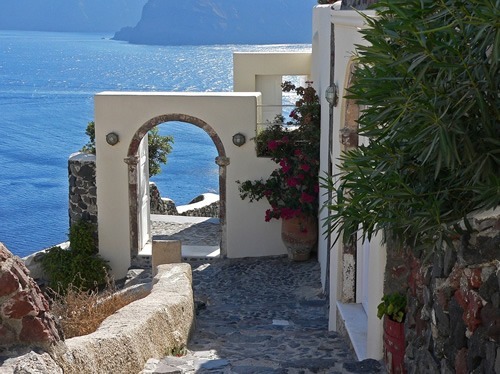 A path to the sea in Santorini. The North Aegean islands lie off the coast of Turkey and form Europe’s traditional sea border with the East. More influenced by Asia Minor, these islands are less touristy than those in other chains. Samos, with its terracotta rooftops, is unique for being the most mountainous with (relatively) remote inland villages. Samos is also the best island from which to cross to Izmir, Turkey, and the famous ruins of Ephesus. Unspoiled Chios has isolated beaches and well-preserved medieval mastic villages, deriving their name from gum mastic: health-giving resin from trees that grow only on Chios. Lesbos and Lemnos, more functional and comparatively low on tourism, also lie in the chain. A house in a fishing village of Samos on a summer day. The Dodecanese islands lie in the southeast between Crete and Turkey and hug the Turkish coastline. The ancient island of Rhodes, boasting more than 300 days of sunshine a year, is known as the “City of the Sun.” Rhodes has it all: ancient Greek ruins, medieval crusader fortifications, nightlife, along with peace and quiet. On Kos, the birthplace of Hippocrates, history buffs will find the ruins of the Asklepion (ancient healing center) and good beaches. 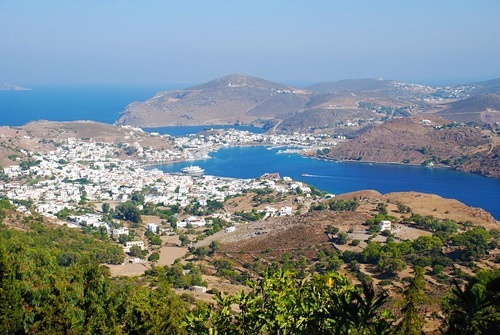 Patmos is known as a holy island—the “Jerusalem of the Aegean”—where St. John the Divine supposedly wrote the Book of Revelation. Finally, quiet, charming Simi, is sometimes called the “Jewel of the Dodecanese” because of its carefully preserved traditional architecture. Sanctuary of Athena, Lindos, Rhodes. 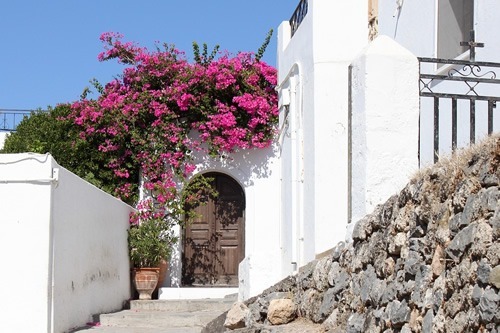 House with bougainvillea in Rhodes. View of the island of Patmos. The Sporades islands (“Scattered”), lie in the Aegean near the mainland. These islands are unique for having escaped the deforestation that plagues most Mediterranean islands. Skiathos is one of the most expensive islands in Greece, but also has some of the finest beaches. Skopelos is more rugged, with thick forests and good hiking. Skyros is the most difficult to reach, and also more traditional. 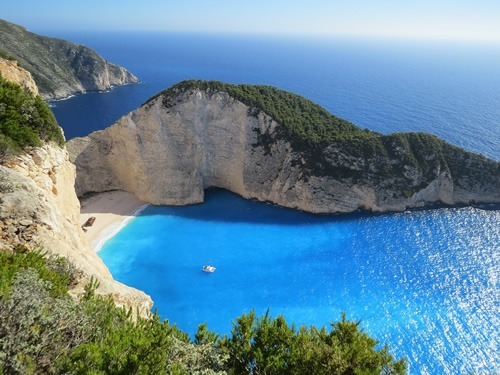 The Ionian Islands lie off Greece’s northwest coast and are famous for their temperate weather, green landscapes, and history. Ithaka, the reputed homeland of Odysseus, can be touristy. Corfu, its neighbor, was the home of Odysseus’ enemies the Phoenicians. Corfu is notable for good beaches, inland villages, and its rich history: Greek, Roman, Venetian, Byzantine, Jewish, French, and British (Lord Byron was fond of Corfu). Kephalonia was the setting for Louis de Berniere’s "Captain Corelli’s Mandolin," filmed here in 2001. Nearly destroyed in a 1953 earthquake, most buildings on Kephalonia are new, but the countryside is still relaxing and picturesque. A beach nestled on the island of Corfu. The birthplace of El Greco, Crete is the largest of the islands and exists as a world unto itself. Crete became part of Greece for the first time in history in 1913, and Cretan pride remains strong. 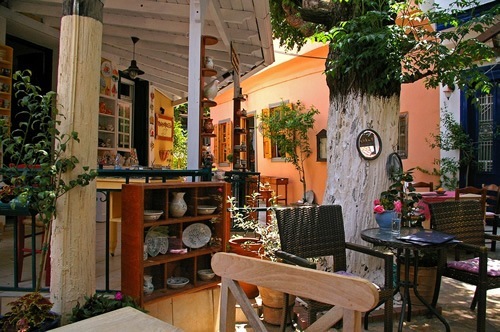 Some Cretan cities boast more than 4,000 years of continuous habitation. Here you find old Venetian buildings, Turkish remains, Byzantine monasteries, the remains of the legendary palace of Knossos, sparkling beaches, lonely wind-swept interior landscapes dotted with sheep, and eclectic nightlife in the capital city of Iraklion. 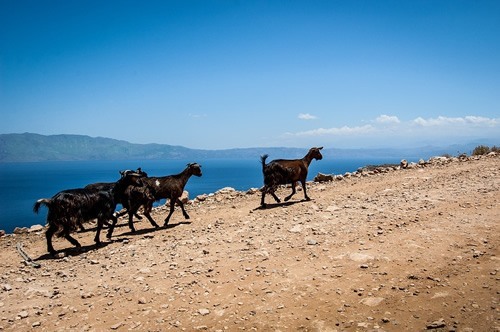 Some wandering goats on the island of Crete. 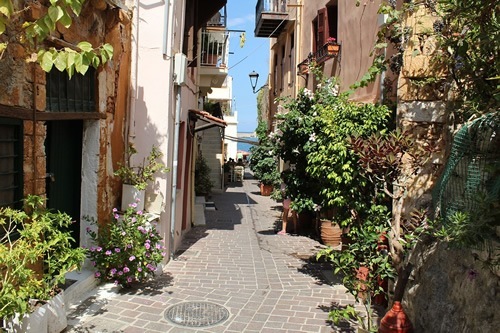 A walking street in Chania, Crete. When ferrying across the Greek Islands, patience is a virtue. The Greek sense of time comes with benefits: a slower pace of life results in paying more attention to the present moment and seizing the initiative. A ferry cancellation offers the opportunity to check out the beach someone on the bus had raved about. Traveling the entire extent of Crete from Chania to Ayio Nikolaos for the mid-week ferry to Rhodes provides a chance to see roadside shrines, empty beaches, lamb road-crossings, and inland towns that might have otherwise been missed. Being temporarily stranded is often a good way to meet locals. At the end of the Odyssey, Homer wrote, “Ready Odysseus, stay! Cease from the struggle… So spoke Athena. Odysseus heeded, and was glad at heart.” Since traveling inherently has its ups and downs, leaving some decisions up to the gods and to the fate that controls even them can lead to a joyful conclusion—a lesson helpful for life’s other journeys. 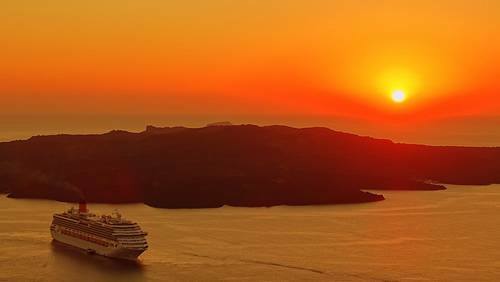 Sailing away from Santorini at sunset. Veronica Hackethal, MD, MSc has lived in a hut on the African savannah, worked in a hospital in Guatemala City, made a half circle of the Mediterranean from Morocco to Turkey, slept under the stars in the Australian outback, and gotten her rental car stuck in the capillaries of a mountain top village in Sicily. She is originally from Los Angeles and studied anthropology at Harvard and Oxford universities, and Medicine at Columbia University. She currently lives and writes in New York City.